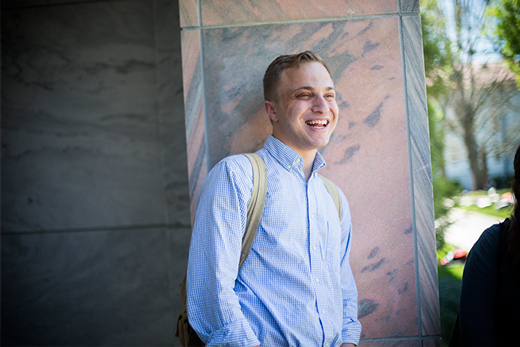 When Ami Fields-Meyer stepped onto Emory’s campus four years ago, his sights were set on Washington, D.C.
“I was going to have a career in politics,” the Los Angeles native says, noting that he planned to major in political science. Then he took a history class focused on the history of inequality in the United States. Fields-Meyer discovered life as a self-described news junkie took on greater depth when he understood the historical context of current events. The tangible power of the ideas has already shaped Fields-Meyer, who decided to major in history and minor in African-American studies. He will share his perspective May 9 as the class orator at the Emory College diploma ceremony, which follows the main university-wide Commencement on the Emory Quadrangle. His topic: How the impact his fellow graduates hope to make on the world will be rooted in the currency of ideas learned at Emory. A selection committee of students, faculty and administrators chose Fields-Meyer to be the sole speaker at the Emory College diploma ceremony after a highly selective process. All applicants had to submit a resume and written speech. Five finalists from that pool were selected to audition by giving their speech and answering interview questions, says Jason Ciejka, assistant dean of the Office for Undergraduate Education. Fields-Meyer’s speech will include projects his classmates have already undertaken, using the power of ideas. Modestly, the Dean’s Achievement Scholar won’t be including his own example as co-founder of TableTalk, a series of pre-arranged conversations between two social or cultural groups on campus that would not otherwise interact. Fields-Meyer and co-founder Adam Goldstein, also a senior, have surrendered the leadership reins in TableTalk, now in its third year and expanded to four other universities. But its mere formation — as a way to expand curiosity from the classroom into the social sphere — reflects Fields-Meyer's personality, his professors say. “Ami leaves me with a very strong and positive impression, yet he is a rather quiet person,” says Pulitzer-Prize winning journalist Hank Klibanoff, who taught Fields-Meyer in the Georgia Civil Rights Cold Cases course. Brett Gadsden, associate professor of history and African American studies, co-teaches the cold cases class and also served as a mentor to Fields-Meyer. Fields-Meyer recalls hours spent talking over ideas and submitting written drafts to Gadsden, only to see his work heavily edited, with lots of remarks in red ink. Gadsden remembers it differently. He calls Fields-Meyer a “delight” for being both interested and interesting in the topics at hand. Fields-Meyer describes many of his classmates that way, saying he hopes his speech will capture the voice of his class and what students have wrestled with and accomplished.